This feature is part of a series focused exclusively on issues impacting higher ed IT administrators. To view the entire series, click here. When Ellen Borkowski, CIO at Union College, arrived on campus in November 2010, routers were already maxed out. The network was so slow that faculty could not even rely on a YouTube video loading to show in class. “We had problems with both our inbound and outbound connection, but also just with it on campus, in terms of older infrastructure,” Borkowski said. The number of devices and technological capabilities have created more network demand than ever before. Whether it’s a smartwatch or a phone, devices are constantly tapping into networks to receive or transmit data. On higher ed campuses in particular, network demand is constant, whether it’s to help with diligent library research or streaming demands in peak hours during the evening. Higher ed CIOs are tasked with ensuring network performance, all while balancing budget constraints and dealing with older infrastructures that cannot handle the increased capacity. On some campuses, network transformation is nearly complete. For others? Well, it’s a work in progress. But an upgraded network allows for a more fluid campus technology experience, where increased virtualization and application delivery is possible. After all, the network serves as the foundation for campus IT. As more technology has become available, bandwidth has become a major pressure point for higher ed CIOs. Take Netflix and other streaming services, for example, which are used heavily in the evenings on college campuses. “Doubling your bandwidth might get you nothing really meaningful during the day so it’s helpful at night, but you’re paying extra for only the evening usage,” Chen said. At Drury University, Executive Vice President, COO and CIO David Hinson says services like Hulu and Netflix can take up as much as 40% of bandwidth over a 24-hour period. "It doesn’t always occur during class times, but typically during the evenings, it certainly will spike up to around 40% on those two services alone." Rather than paying extra for increased bandwidth across the board, Muhlenberg works with providers that offer caching, allowing for the college to pay less for overall bandwidth, but it allows for better performance for streaming services specifically. 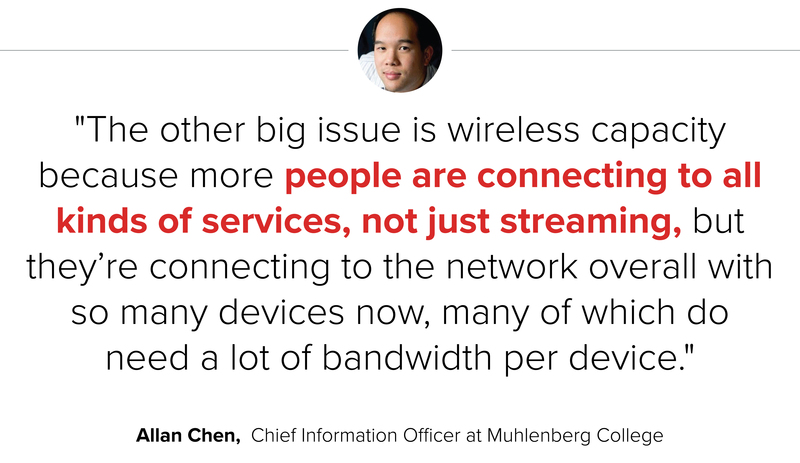 "The other big issue is wireless capacity because more people are connecting to all kinds of services, not just streaming, but they’re connecting to the network overall with so many devices now, many of which do need a lot of bandwidth per device," Chen said. "So you also have to be handling capacity as well as volume." Now, there can be classrooms with 20 people, but with at least thirty devices. In some instances, it’s a two-to-one ratio of people to devices. When you factor in residential students, as well as the boom in wearables, you could see that ratio rise as high as five-to-one​ due to things like Fitbits, Smart TVs and gaming consoles. As the ratio increases, network access points can’t handle the capacity anymore. That demand has created a fundamental change in how networks are designed. "Since we’ve gone to 1 gigabit, I don’t think we’ve been much over 600 — but it’s always a concern," said Hinson. "And it’s primarily because students just carry more devices on them these days." At Drury, Hinson says the university separates traffic between student residential networks and classrooms through V-LANs, and it also uses traffic shaping to make sure that only desired traffic is kept on its network. "I won’t say [wearables] puts a strain on your network scopes, but you certainly need to be aware of them — particularly if you created scopes based upon the number of devices that were connected just a few years ago." As for devices like Smart TVs and gaming consoles, like many other institutions, Drury is instituting MAC authentication, requiring students to register their devices for network access. Part of the university's decision to implement authentication stemmed from students using their own routers on campus, creating unsecured networks as well as interference with RF signals from campus Wi-Fi. "MAC authentication isn’t the be-all, end-all of authentication," Hinson said. "Obviously, someone could get on the wire and find a legitimate MAC address from one of these devices, but it will give us a measure of control while not irritating our students to the point where they wouldn’t use that methodology." At the end of the day, as Stonybrook University CIO Dr. Melissa Woo notes, handling campus network capacity is easily as much a question of "how much" on top of simply needing to do so in the first place. "I get that there’s a finite amount of bandwidth, but at the same time, if there are educational uses for some of what the students are doing, then why should we be trying to limit them, within reason?" Would you like to see more education news like this in your inbox on a daily basis? Subscribe to our Education Dive email newsletter! You may also want to read Education Dive's look at why 9 CIOs chose higher ed over the private sector.